Julie Bishop's budget dress was nothing short of glorious. Last night the Australian public shunned Married At First Sight and switched over with anticipation to everyone’s favourite yearly viewing: The federal budget. But there was at least one person who considered the federal budget 2019 an occasion worth getting excited over (and dressed up for). 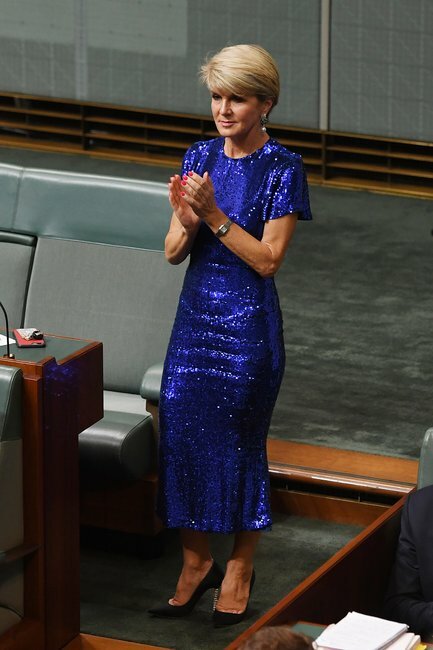 The retiring former foreign minister chose a very sparkly, very blue dress and honestly we cannot look away. The $1299 Rachel Gilbert dress is described on the designer&apos;s website was being "perfect for a special occasion" and HECK YES the last time she needs to be around for a budget qualifies. Oh my god I love blue sequins. I know I shouldn’t be focusing on your clothes but on your achievements as a Minister (which are too numerous to list) BUT what a fabulous dress! While we were all extremely distracted by Julie&apos;s fabulous gown, we did manage to pay the budget a wee bit of attention (unfortunately no, the announced tax offset will not help us afford her dress). As predicted, Frydenberg delivered a "no-losers" budget just weeks out from the May election, pitching the coalition as responsible economic managers who can still splash some cash. Get a full run down of the budget winners and (few) losers here.